Chinese army soldiers in Xinjiang, a high, remote territory on the border with Pakistan, Afghanistan, Kyrgyzstan, Kazakhstan and Mongolia, can’t always count on road access to strategic regions. 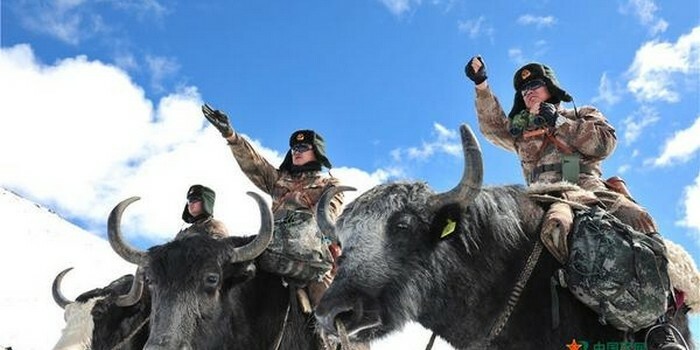 So they ride yaks, instead, as Xinhua’s recent photos illustrate. There are a few other true cavalry units in the world. Horse units are still fairly widespread — U.S. Special Forces rode on horseback in Afghanistan in 2001. The Jordanian and Indian militaries deploy camel troops.